This was the 3rd season I have had the honor of instructing the Babes in the Bumps. What a great year. My group started out with desire for improvement. The scope of improvement goes well beyond skiing the bumps well. We approached each week with the perspective, “What has this past week presented to us?” What gave us difficulty? What did we enjoy? Hard snow, powder, big bumps, trees, etc. With that in mind, we set off to experience the day. Early on, I made a terrain mistake. I was lured into Psychopath Gully by soft windblown snow. When we made it to the gully, it was hard southfacing snow condition. A few in the group handled it well, a few… well it become a goal for the season. On the final day we skied it again. There were some who thought (hoped) I would have forgotten about that incident. Nope. We set off to ski it as the temperatures warmed. I did not offer much new instruction. We had several weeks of preparation. And you know what? We skied it well. Isn’t progress fun. We had some powder filled days too. A skied some steeps and became better at dealing with firm snow.. And of course we skied better bumps. It was important for our group to see a variety of lines in the moguls. I recently purchased a helmet camera, and I am creating a video lesson to illustrate a variety of lines in the bumps. 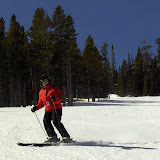 On the final week I had the fortune of skiing with the Thurs and Friday Babes groups. There was a bit of wind and some soft snow on thursday. We decided to head to the trees. There are a few tree trails on P9, near the Breck Smokeshacks. We had some fun there. The theme was seeing the outside of the corridor, rather than the fall line only. With a wider focus, it allows the skier to look for other tree skiing options. “This line is closing, I will go to that opening”. On thursday, we took those skills into the Burn, and the southside of P10. I can’t forget the fun on Upper Lehman. Skiing the run the way kids look at it. There is so much possibility there if we are looking for it. We dipped into P10 for some lunch. I would suggest that everyone ski a run differently that they would usually ski it. I know a number of very good skiers that ski a run the same way everytime. They have convinced themselves they have found the best line on the hill. Whatever, that is OK. But it certainly isn’t the way I prefer playing on the mountain. Obviously. I look forward to continued fun in upcoming years. Jon, I want to join the Babes in the Bumps group for next year. How do I do that. I am currently skiing Breck, level 7, unlimited lesson pass and have met a few of the women already while waiting for our instructors each Friday morning. I was looking around and just happened on your blog. you can go to the Babes website @ http://www.mysnowpro.com/babesonbumps They will have all the sign up info. It is a great program.